Elliebelly Knit & Dye Works > Blog > Knitting > Lida. A Lace Shawl in Progress. Lida. 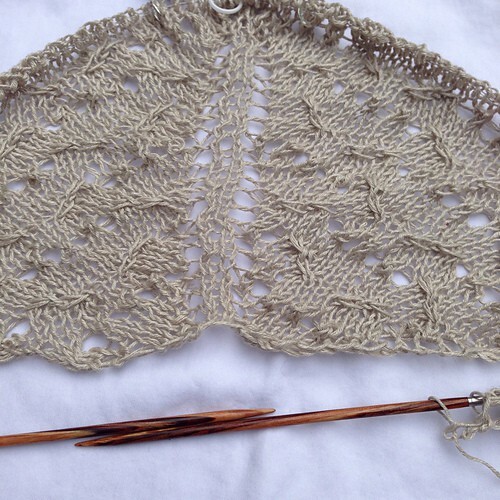 A Lace Shawl in Progress. Lida makes my heart beat. I don't usually knit complex lace, but this pattern, by Bristol Ivy, was beyond my ability to resist. I am not accomplished enough to knit this pattern while I'm talking, watching tv, or engaged in any other activity, so I haven't found a lot of time to work on my Lida. But I have been able to finish the set up rows and the first lace repeat. It is so lovely. I cannot wait until it is grown up into the perfect triangular shawl and it is mine, all mine, to wear. One note about taking on this pattern if you are a newish knitter. It is very clear and well written, but it is written for a more advanced knitter and assumes you can internalize the lace pattern, which is set forth in one section of the pattern, into the appropriate place in the rows, which are set out separately. And, with each repeat of the pattern, you increase the number of lace pattern repeats you set inside of each row. If that sounds confusing, it's because I am definitely not one of those advanced knitters who does this intuitively. I have to think it through carefully. And, since I seem to be destined to knit a bit of this and then set it down for several days or even a week before picking it back up again, I wrote out a version of the row repeats with the lace pattern included in brackets within each row. If that sounds like something that might help you with this pattern, my notes are here. I'm taking Lida along as my knitting project on a yoga retreat later this month. I don't have any illusion that this is going to be a quick knit, but I do want to try to work on her as I find time over the next few months. Some of my simpler projects get more attention, as they are perfect for carpool lines, airports and doctors offices, but Lida owns my knitting heart right now. ← One Skein Projects – Pattern Giveaway!